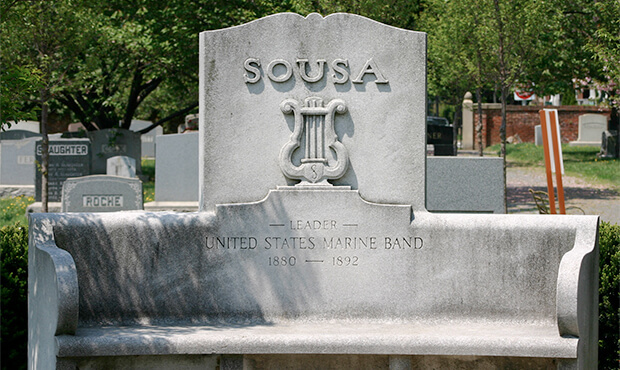 The Sousa memorial bench at Congressional Cemetery in Washington. On March 6, 1932, American band conductor and famed composer John Philip Sousa passed away at the age of 77 in Reading, Pa. Best known as "The March King," Sousa led the United States Marine Band for 12 years before forming his own band and performing around the world in more than 15,600 concerts over a nine-year time span. Among Sousa's most famous works is "The Washington Post," "Semper Fidelis," (the official march of the United States Marine Corps," and "The Stars and Stripes Forever," which has long been identified as the most famous march in the world. Prior to the formation of Drum Corps International, Sousa's marches were a mainstay in the drum corps repertoire. The works have been performed a few times by DCI corps in their competitive programming, and "The Stars and Stripes Forever" appeared in the World Championship Finals performances of the Argonne Rebels and Madison Scouts twice and Bridgemen once, the latter two corps performing the work for the nation's Bicentennial celebration in 1976.